Pictured with the lady of the evening, Billie Jean King and Carla Renata. The Battle of the Sexes tennis match was the type of event that makes everyone stop and remembers what they were doing when it aired. It was an unforeseen, monumental moment in sports history. The battle brought in over 50 million views from around the world. Those are great viewership numbers for today, not to mention 1973 when the game-changing match took place in Houston, TX. 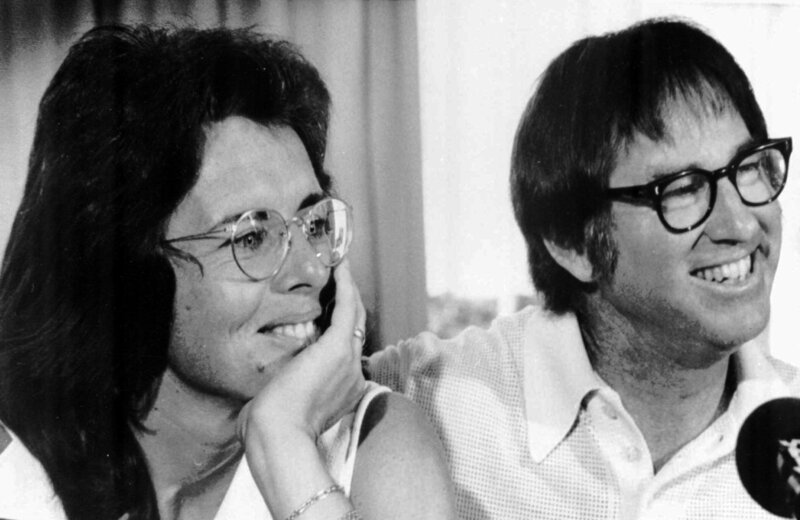 Battle of the Sexes takes a very intimate look into Billie Jean King’s life, often sharing her determination and the incredibly strong will that lead her to have the biggest influence for women gaining equal pay to this very day, in the world of tennis. There is a heavy emphasis on her love life taking you into her selfless marriage to Larry King who fully supported her mission for equal pay amongst women. In this first-ever theatrical debut on King’s legacy, a great deal of focus is on her world wind love affair with her hairdresser who ultimately uncovers Billie Jean King’s attraction to women. Battle of the Sexes grand slams into national theaters September 22. Before the world premiere, I was a part of a tennis clinic hosted by esteemed tennis player Vince Spadea! He has played professionally in the Australian Open, French Open, Wimbledon, US Open and of course the 2004 Olympic games representing the USA! We met at the Westwood Tennis Courts on Saturday morning. I think most of us thought we were just going to look on and maybe participate or maybe not. Much to our surprise when we met Vince Spadea, we ended up being broken into teams went through a sort of tennis 101. A couple of people had played before but for me, it was one of the few sports that I had not tried. He showed us three basic moves and said if you stay away from those then it’s not tennis it’s something else. It’s cheating! It was an enjoyable experience, despite me spraining my ankle. Austin Stowell showed up and was Mr. Personality. He was great to chat with on filming Battle of the Sexes. Elisabeth Shue packs a mean swing! She’s so badass she played tennis in jeans and heeled boots! You met BJK! That is soo cool!! I definitely want to watch this movie. I have high hopes from it. It sure looks like a great event. I so want to see this movie!! I love Emma Stone, but I’m here for Steve Carrell. He is my favorite!! Sounds like it’s a great movie and I’m all for girl power anything. It was all about girl power! What a cool experience! I love Emma Stone and this film looks very good! She always delivers in her roles! I enjoyed this experience very much. It makes it unforgettable. Thank you for sharing this! I can’t wait to see this movie!! Love both of the leads. I’m sure they’re going to be pretty comical together. Can’t wait to watch the movie! For sure, a moment that marked our history. It’s so cool that you were able to experience this and meet Billie Jean. It’s a good lil history lesson. Looks like really interesting and fun event! It must be great experience to be part of it. It was great, like a history lesson! Lol, I love that woman who played tennis in jeans and heeled boots! I need to try that. I know, it was an exciting sight to see!